Through archival excerpts from his finest filmed lectures interwoven with exquisite images and evocative music from around the world, renowned mythologist Joseph Campbell takes us on a journey of transcendence and illumination, a trip through the mythological symbols and sagas left by our ancient forebears. What is revealed en route is “mankind’s one great story,” the grand drama played out by all cultures on all continents since time immemorial. Sukhavati is like an extra-credit master class for anyone who was captivated by Bill Moyers’ landmark series Joseph Campbell and the Power of Myth. 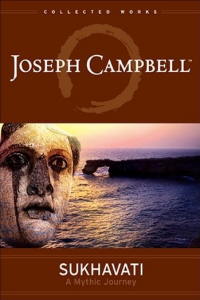 Produced, directed, and edited by Maxine Harris with the support of the Joseph Campbell Foundation (as part of a “Collected Works” series of DVDs), this simple, 78-minute program combines soothing imagery and music from around the world with relevant excerpts from some of Campbell’s seminal lectures on mythology.